Now that they've re-signed their apathetic, humorously smoking quarterback, the Bears are THIS CLOSE to the Super Bowl. Yesterday we told you how every team in the AFC can make the Super Bowl. For realz. Joe even came up with an elaborate Tebow-Vick two-quarterback system for the Jaguars, and had Johnny Manziel leading a perennial bottom-dweller to Super Sunday. Jeremy, on the other hand, thought the Raiders were in such bad shape, that coming up with a fictional scenario where they made the Super Bowl was not something he was prepared to do. You can check out that article here. Now, join us once again as we brighten your day and let you know why you're favorite NFC team is TOTALLY making the Super Bowl next year. Don't look now, but the NFL's leader in Quarterback Rating wasn't Peyton Manning, it was Nick Foles. Manning set the NFL record for passing touchdowns, but it was Foles, not Manning, who led the league in touchdown rate (percentage of pass attempts that went for touchdowns). Foles, in fact, posted the third-highest passer rating of all time, behind only 2011 Aaron Rodgers and 2004 Peyton Manning. Foles will likely regress next season (throwing only two interceptions in 317 attempts isn't just a fluke, it's an act of God), but the offense overall will likely be better. Jeremy Maclin, should they bring him back, will be healthy and provide another weapon on the outside to open up the middle of the field even more. The dead weight on the defense (cough Patrick Chung cough) will also be jettisoned, meaning they likely won't surrender north of 4600 passing yards again. After playing the AFC West last year (going 1-3), they get the AFC South next year, and another full off-season under Chip Kelly can only be seen as a positive - they'll continue to roll over their offense to better fit Kelly's system, upgrading the Jason Avant and Riley Cooper spots with more speed, and getting quicker on the offensive line. With an improved offense and a re-vamped defense, Philadelphia goes 12-4, snags a first-round bye, and rides the momentum from there. The Cowboys have a very specific strength and a very specific weakness. Their strength is their top-end talent. Tony Romo, DeMarco Murray, Dez Bryant, Jason Witten, Tyron Smith, DeMarcus Ware, Sean Lee, Brandon Carr, and Morris Claiborne are either top-10 players at their position, or in the case of Claiborne, have that type of potential. Their weakness is that they have no depth. None. They're entering the offseason already already over the cap by almost $21 million, and that's because of how much money they pay that top-end talent. It leaves them no room to fill out the bottom of their roster. So what happens when DeMarcus Ware misses three games, Sean Lee misses five, Morris Claiborne misses six, and the rest of the defense is a hodge-podge of useless has-been's and never-was's? They surrender 6645 yards of total offense, the worst in the league. So how do the Cowboys make it to the Super Bowl? With an incredibly lucky stretch of health. Much like Kansas City and Carolina built top-five defenses in large part because of health and continuity, the Cowboys luck out and don't suffer the rash of injuries that has plagued them in recent seasons. Tony Romo slings the ball all over the field and convincingly establishes himself as a top-5 quarterback, a designation that finally sticks as the Cowboys advance to the Super Bowl. We kind of already know what the model for the Giants is. They need their high-variance quarterback to near the league leaders in yards per attempt, not interceptions. They need their running backs to not fumble every other time they touch the ball. They need to create matchup problems with their three-receiver sets. And most of all, they need their all-pro defensive line to generate more then 34 sacks. If Jason Pierre-Paul comes back healthy, Eli re-discovers his accuracy, David Wilson softens his stone hands, and Victor Cruz, Hakeem Nicks, and Rueben Randle run to daylight, the Giants will find themselves back in the playoffs. And from there, they know what to do. Going worst to first in the NFC East is nothing novel, and the Redskins make it look easy with a fully revitalized Robert Griffin III. Now healthy, RGIII proves his rookie year was no fluke, as he emerges as the best dual-threat quarterback in football, throwing for 3,500 yards and rushing for another 1,000. Running back Alfred Morris rushes for 1,500 yards and the Redskins lead the league in rushing as RGIII begins to receive MVP hype. The defense still has issues, but Ryan Kerrigan breaks out with 13 sacks and five interceptions on the strong side, while Brian Orakpo excels, even by his standards, on the weak side with 16 sacks. The two terrorize quarterbacks enough to make up for the porous run D, and Washington's offense plays keep away well enough that opposing teams can rarely take advantage of the Redskins' limited front. Washington snags the top seed in the conference with a 13-3 record, and ride RGIII and its pass rush all the way to the Super Bowl. In celebration, Dan Snyder announces, once again, that he will never change his team's offensive name. This is the easy one. When Aaron Rodgers played start to finish, they were 6-2, with their only losses coming on the road to San Francisco and Cincinnati (both playoff teams). When Rodgers was out with his injury, they were 2-5-1. So with a healthy Rodgers (plus a healthy Randall Cobb, a healthy Clay Matthews, and a healthy offensive line wouldn't hurt either), the Packers run off a 12-4 record and they're able to ride a balanced offense back to the Super Bowl. 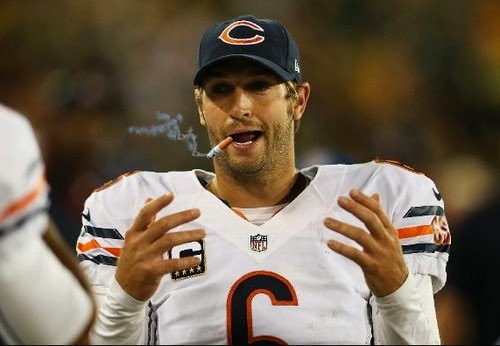 All of Chicago's "meh" response to the Bears' re-signing of quarterback Jay Cutler turns out to be totally wrong, as the strong armed gun slinger comes out of the gates firing, leading the Bears to an 8-0 start with the league's best passing offense. A now healthy Bears defense climbs up into the Top-10 in the league, and Chicago finishes a dominant 14-2. The playoffs begin with an easy win over pass-happy Green Bay, as the Bears revert to their running ways with Matt Forte to overcome a snowy night at Soldiers Field. In the conference championship game, Seattle's Legion of Boom is no match for Brandon Marshall and Alshon Jeffrey. The two physical receivers out-muscle the Seattle corners for three combined touchdowns, and Chicago's Tim Jennings picks an overly aggressive Russell Wilson to seal the deal. The end of 2013 was disastrous for the Lions, and 2014 doesn't start much better. Early injuries to Ndamukong Suh and Ziggy Ansah hurt the Detroit rush defense and pass rush, but it forces young defensive backs Darius Slay and Bill Bentley to grow up in a hurry. Their improved play, along with a return to form from Glover Quin, make the Lions secondary the league's most improved position group. By the time Suh returns in week 10 and Ansah in week 12, the Lions are a Top-5 defense, and lead the league in turnovers forced. On offense, the passing game is still the star, led by Calvin Johnson, but Matthew Stafford begins spreading the ball around, and second-year receiver Patrick Edwards breaks out for 850 yards and 9 touchdowns. A great all around year from Reggie Bush allows the Lions to finish strong, winning their final five games for a record of 11-5. The Wild Card Lions come into the playoffs as the proverbial "hot team," and ride that momentum from the six seed all the way to the big game. The Vikings were able to turn things around after a 1-7 start to finish the season 4-3-1, finding a very nice groove offensively thanks to the emerging Cordarrelle Patterson and the steady veteran Greg Jennings, who compliment all-universe running back Adrian Peterson about as well as you could hope. The only things holding them back were their inconsistent quarterback play and a dismal defense. Those seem like tough problems to solve, but they might work themselves out organically. With a number of strong quarterbacks available in the draft and the Vikings picking eighth, there should be one available to turn Minnesota's backfield around. With improved quarterback play, the run game returns closer to 2012 levels, when they were the 2nd-best rush offense in the league and cruised to a playoff berth at 10-6. And with their improved running game, they're able to bleed clock, keeping their flawed defense off the field. When it is on the field, Jared Allen and Brian Robison continue to make life a living hell for opposing quarterbacks, and they ride the time-tested model of Pass Rush + Running Game + Deep Play-Action all the way to the Super Bowl. The Panthers found an identity this year, centered on a dominant front seven and an offense willing to take risks deep in opposing territory. The reason they came up short, however, is because they secretly had trouble running the ball when the player running with it wasn't Cam Newton. DeAngelo Williams and Mike Tolbert combined for 1204 yards, but it took them 302 carries to do it, an average of barely under four yards per carry. Williams is 30 years old and now four years removed from his last 1000-yard season, so it may be time to address the running back situation. Another need is at wide receiver, where Steve Smith is aging and Brandon LaFell will never be a serious threat. The defense is just about set - all they have to do is re-sign Greg Hardy (which should be a priority after he recorded 15 sacks this season) and they'll be a top-three unit once again. But if they can upgrade at running back or wide receiver (or both), and open up the playbook to include more zone-read/inverted veer action (which they went away from for unexplained reasons this year), the Panthers could go back to having a top-10 offense like they did in Newton's rookie year. The Saint defense took a major step in 2013, but with Kenny Vaccaro back in the fold, it makes a quantum leap in 2014. New Orleans is now not only "pretty good," its defensive speed is downright scary in coordinator Bob Ryan's scheme. On offense, Drew Brees is Drew Brees, Jimmy Graham is Jimmy Graham etc, but a 1,200 rushing season from (dum, dum dum) Mark Ingram makes New Orleans the most unstoppable attack in football. A 13-3 record (including 8-0 at home) leads to home field advantage, and you know Brees and the boys don't lose in the Dome. Did 2013 really happen for the Falcons? I mean, seriously, Tony Gonzalez came back for THAT? Atlanta was so close just a year before, bowing out to the 49ers in the NFC title game and that team, more precisely, that passing game, returns in 2014. With a now-healthy Julio Jones and a motivated Roddy White at his disposal, Matt Ryan throws his hat back into the "elite QB" conversation with a 4,800 yard, 44 touchdown season. On the ground, the Steven Jackson Atlanta thought it was getting in 2013 shows up in 2014. Running with reckless abandon and daunting physicality, Jackson is the perfect compliment to Atlanta's high-flying passing attack, helping the Falcons lead the league in total offense. The defense is still a mess, but it improves upon last year's horrid numbers, going from giving up nearly 28 points a game to only 22. The Falcons are now, essentially, this year's Broncos because, oh yeah, Tony Gonzalez comes out of retirement as mini camp starts to give it ONE MORE GO! The Falcons win home shootouts against the Packers and Seahawks, and Dirty Bird their way to New Orleans. 2013 was not a strong year for the Bucs. They went 4-12 and didn't beat a single team that finished over .500. But after parting ways with Josh Freeman, they found a potential keeper in Mike Glennon, who surprised to have the best season of any 2013 rookie quarterback. The Bucs have talent across the board, much like the 2012 Chiefs did. Doug Martin, Vincent Jackson, Carl Nicks (if they bring him back), Gerald McCoy, Darrelle Revis, Lavonte David, and Mark Barron are all Pro Bowl-caliber players. So upgrading from Greg Schiano to Lovie Smith should foster a system to maximize that talent. The NFC South plays the AFC North and NFC North next year, both divisions that disappointed compared to expectations this past year. If they disappoint again, Tampa could be the NFC candidate for a Kansas City-like turnaround. Seattle continues unleashing Richard Sherman on sorry receivers. They do exactly what they did last year only this time, with the game on the line, they don't try Richard Sherman with a sorry receiver. Let's say Kaepernick buys time in the pocket, then scrambles for a game-winning 18-yard touchdown. He probably could have done that Sunday, but stuff happens. Arizona goes into the offseason knowing it was the best team to not make the playoffs, and coach Bruce Arians gets conservative to help the Cardinals take the next step. First, he wants to feature his defense, which ranked in the Top-7 in football by any metric, and much higher by some. To do that, he decides to take the air out of the ball, and limit the throws of turnover machine Carson Palmer. Though he did throw for nearly 4,300 yards, he also threw it to the other team 22 times in 2013. New free agent signing Ben Tate comes with, perhaps, too high a price tag, but he upgrades the Cardinal ground game instantly, and Rashard Mendenhall finally gets healthy to give Arizona a fantastic one-two punch in the backfield. The Cardinals jump from 23rd in the league in rushing all the way to the Top-10, and the newly conservative Palmer throws for 3,200 yards and 17 touchdowns with only eight picks. With a ball control offense that doesn't give it away, Arizona's opportunistic defense thrives, making them the 2013 Seahawks 2.0. Arizona shocks everyone to finish 13-3, but Palmer throws two picks early in the NFC Championship Game against Green Bay. Still, Patrick Peterson returns an Aaron Rodgers interception for a touchdown, then takes a punt to the house to give Arizona another improbable trip to the Super Bowl. St. Louis is perhaps the most unlucky team in the league, a legitimately good team that happens to have the misfortune of playing in the best division in football. They went 1-5 in the division and 6-4 outside, including wins over Indianapolis, Chicago, and New Orleans. If there's any team that might be able to follow the Carolina model of Dominant Front Seven + Functional Offense = Playoffs, it's St. Louis. Robert Quinn led the league with 19 sacks last year, Chris Long chipped in with 8.5 of his own. James Laurinaitis and Alec Ogletree are both standout linebackers, and Janoris Jenkins is a future star at cornerback. They also hold the No. 2 pick in the upcoming draft, thanks to the Robert Griffin trade, and there are a number of directions they can go in - Jake Matthews could shore up their offensive line, Sammy Watkins could give them a big play threat in the passing game, Jadaveon Clowney, Anthony Barr, or Khalil Mack could double down on an existing strength (defensive line/linebacker), or they could trade back to acquire even more assets. Sam Bradford was having a strong season, his best yet, before he went down with a knee injury. If he can come back strong next year as the defense improves and the offense (most notably Tavon Austin) improves around him, the Rams could grab the No. 6 seed (still seems unlikely that either Seattle or San Francisco would miss the playoffs). From there, the defense could do the rest.